The Cradle of Aviation supports STEM Workforce Development through Job Shadowing partnerships, an annual STEM Career Expo, Guidance counselor enrichment and our many competitions. A one-stop college admissions resource, providing worksheets and guidelines for your successful journey into college. For sometime now, residents and company owners have complained of the “brain drain” on Long Island. Masses of young adults are leaving the island to go to college and seek employment else where, uninformed of the opportunities the island holds. For business on the island to grow, it needs a plentiful, skilled, and educated workforce. 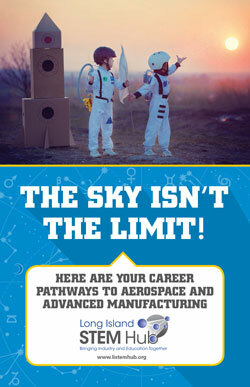 Students need to know what opportunities are available for them here on Long Island. The reality is that most students are unaware of the career pathways and opportunities on Long Island. The Cradle of Aviation job shadowing component seeks to address these issues by retaining students on the island and better prepare them for the careers of tomorrow by establishing partnerships between the academic and business communities to develop a workforce with the 21st century skills and education needed for success. Long Island needs to invest in our students, our future workforce, and to inspire students to remain on Long Island to pursue their career passions. This initiative helps students gain real-world skills and hands on learning experiences while making early connections to the breadth of employment available to them via job shadowing. In 2012, the museum held it’s first Annual STEM Expo, open to all Long Island schools; the purpose of this event is to expose as many 10th and 11th grade students to the various careers and applications in STEM disciplines especially here on Long Island. Exhibitors, professionals, and local colleges, featured their careers, conducted hands-on demonstrations and showcased real world applications of STEM. We had over 400 students attend, over 35 industry representatives from companies like Brookhaven National Lab and Jet Blue along with local college such as Farmingdale State College and Dowling College. Sampling of Long Island career sectors that will be represented: Healthcare, Aerospace, Engineering, Renewable Energy, Manufacturing, Homeland Security, Information Technology & Communications and Aviation. We host many STEM related competitions through-out the year such as the Rube Goldberg Machine Contest, the KidWind Challenge, the Junior Solar Sprint competition, Brookhaven National Lab' MagLev competition, the Cyber Patriot cyber defense competition and the Verizon Mobility Exploration Challenge. Visit our Competitions page for more details on these and other competitions. For more information about these programs and events, please contact Jennifer Baxmeyer, Director of Education at 516-572-0559 or use the form below.